Learning is the new kind of labor. It’s no longer a separate activity that occurs either before one enters the workplace or in remote classroom settings…learning is the heart of productive activity. The staff in the company is well equipped with necessary training and skills. The firm can get the right information at the right time. The firm can identify and exploit the opportunities. The firm can minimize or eliminate its weaknesses. That’s where 3D EDUCATORS – the dynamic team of TRAINERS and CONSULTANTS can make the difference. This dynamic state has given birth to a new breed of company – 3D EDUCATORS - TRAINERS & CONSULTANTS the team of specialists, who can analyze, create, and prescribe a cure for the ailments affecting your business. As "3D" we are working in three dimensions and cover all the aspect of (XYZ Dimensions) regarding training & development, either related to Management, Marketing & Sales, Personality Development, ERP Systems trainings, Computer Networking and Programming, Graphics, Engineering, Industrial based Trainings, and required customized training programs. The customized training programs can be developed as per your required need after the detail analysis. The concept is to increase your productivity and build and develop the image of your organization in local and International market. 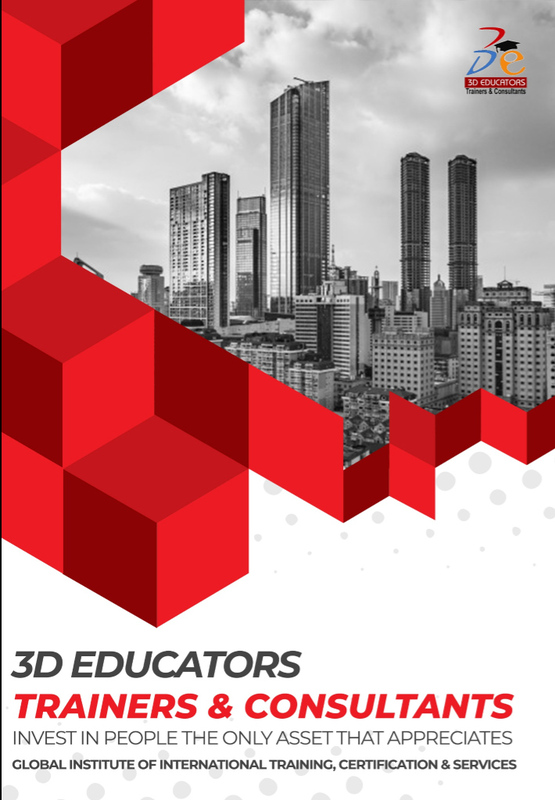 3D EDUCATORS have so many ways to train your staff and yourself with the High End Training Consultants who may have the world over experiences on different projects. Sunset Training Programs, Which is the longterm and based on 1,2,3 Months duration. Further the required and general training workshops also being offered according to the training calendar. If you have any queries please do not hesitate to contact us at the given numbers and address; we would like to have a mutual and long term business relationship with you. Awaiting for your call to give and asses you the best of the best services in this regard.